I used to be a much better reader (i.e., would read for long stretches of time instead of the ten minutes before falling asleep that I save for myself now), so maybe the problem I had with this book was mine and not the fault of the book, but I still don't quite know what happened. The intricate plot hinges on unlikely flukes of chance, and it lost me, and I didn't care enough to put in the work and go back and figure it out. In the end I had lots of questions about the plot (like who is the guy in the bookstore who picks up a copy of the book, which appears to have been published in English? ), but it might not have been problematic for a better reader. Apparently I missed that Zvi Litvinoff did not die in Europe before World War II, which was a pretty important detail. Ugh.Zvi is just one of many characters in this book we do not really care about. In addition, we do not learn much about the original Alma (probably because she is the "magic maiden that everyone falls in love with" trope and not an actual character). I'm also not sure why we meet young Alma's uncle, or Zvi's wife, or any of Isaac's family. Did Isaac seem like kind of a jerk to you? The second most compelling character is young Alma's brother, but his part in the book is dismayingly small.If I had read the first chapter about Leo Gursky as a short story in a collection, I would have loved it. He is a compelling character, and it's interesting to follow him around. In fact, that might have made a better novel, but I sensed that Krauss didn't have the courage to just stick with plain, old, interesting Leo. The operatic framework of the novel, the mystery of this fantastical book, had the disadvantageous effect of occluding her strongest character. [Although, the constant repetition of "And yet." and "But." drove me crazy. His voice was strong enough without these ticks! We understand his longing and incompleteness, we don't need it punctuated every few sentences! But. Some people loved it. And yet. ]One of my pet peeves is when a writer makes writing or a book the centre of his/her story. It's like the author wants to convince us that writing is wondrous, powerful, transformative, etc. First of all, it would be better to write a novel that good than to talk about a fictitious one. Secondly, to write about writing or to write about a work of writing is too self-referential for me. If they can't pull it off flawlessly, authors need to find a better way to express their characters' inner lives than by making them writers. Also, there were so many literary tricks. 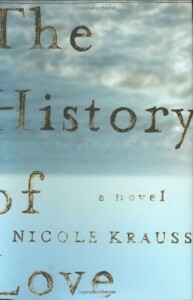 I ended up thinking that Krauss had a solid work of fiction, but she dressed it up so much it ended up coming off as kind of cheap. Maybe it was just too much for my tastes. Most people seemed to love it.